Nesbitt Realty can sell your property in Woodbridge, VA. We are a family business that appreciates the opportunity to serve your needs. 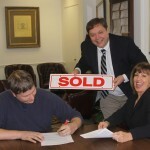 We can list your Woodbridge property to help you achieve your real estate goals. For most people, the prospect of selling their own home can be positively daunting. First of all, there are usually plenty of things to do just to get it ready for the market. Besides the traditional clean-up, paint-up, fix-up chores that invariably wind up costing more than you planned, there are always the overriding concerns about how much the market will bear and how much you will eventually wind up selling it for. Will you get your asking price, or will you have to drop your price to make the deal? After all, your home is a major investment, no doubt a rather large one, so when it comes to selling it you want to get your highest possible return. Yet in spite of everyone’s desire to get the top dollar for their property, most people are extremely unsure as to how to go about getting it. Talk to a Nesbitt Realty agent and we’ll give you a market analysis of your property’s value as well as a report on trends in Northern Virginia real estate and real estate in your neighborhood. We’re a local family-run business and we appreciate the opportunity to serve you. Contact us for an accurate assessment of your property values in Woodbridge.